It's late fall. At my school that's the right time of year for Sophomores to be seeking letters of recommendation for the ACE program. The ACE program is run by the Maricopa County Community College system. The ACE program allows high school students the opprotunity to take college courses on the weekends and during the summer. The credits earned are usally transferrable to any of the major in-state universities (UofA, ASU, NAU). If a student sticks with the program it is possible to earn around 20 credits. That means that a stuudent could enter with most, if not all, of their Frosh year done. It's a wonderful program and I have been working like a madman to finish all the letters of reommendation. The messenger of the writing gods. ﻿The nice thing is that the LORs are fill-ins. I don't have to write a full-blown letter. That comes after Christmas holiday when the Juniors start making their plans. The perfect machine for filling in forms has to be my Hermes 3000. 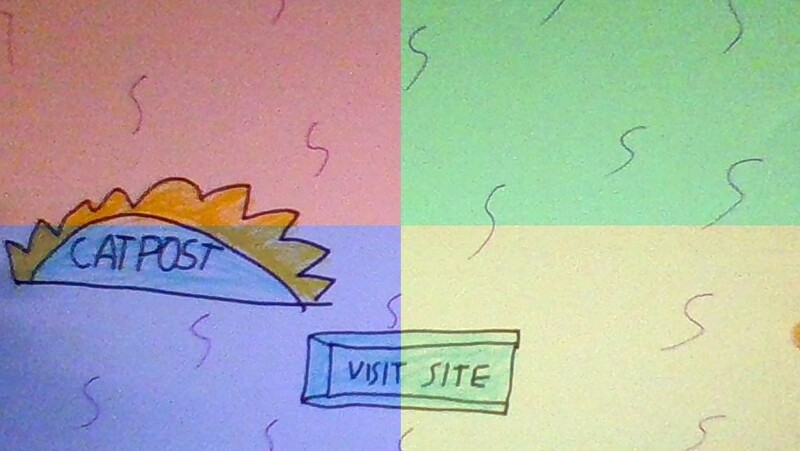 The transparent line guides make this task simple. I have a devil of a time filling in lines on my desktop HH. The line guide makes all the difference. The greatest boon, however, has to be the typeface. Petit-Pica is short enough to fit on form lines, while still being easy to read. Initially, I was resistant to the Hermes. The action felt, for lack of a better word, mushy. Everything I read said that this typewriter was the choice of choice writers. I just couldn't see it. It took me a little while, but I have come around. I really like my Royals; especially my HH standard and late 40s QDL. But, when I need a very good portable the Hermes is the one. A shade, in which to sing---of palm or pine? Typewriters of the 60s and 70s from Holland or Portugal or England, while perfectly lovely machines, seem hollow and empty. They don't have the soul of the earlier ones made in the US or Germany or Switzerland. They represent the last throws of the typewriter industry. Every one stamped out in Mem Martins was a mere shadowy wraith of the Olivers, Quiet Deluxes, Silents that came before. They are a developmental graveyard where every advancement is a gimmick; typebar de-jammers, interchangeable type elements, 3 garish colors. Every one produced is a dollar sign; make money rather than make machines. That's why I like to have them around. 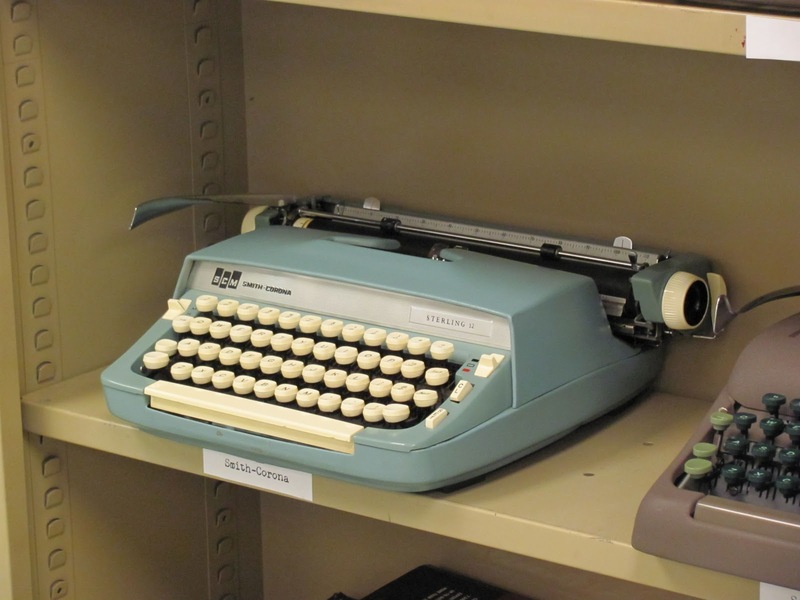 These typewriters are the Praetorian guard whispering "Remember, the old replaces the new." They keep it grounded. My grandfather, who recently moved to the Valley, is a garage sale maven. He has been making the rounds and found this lovely beast for the kids. It came in the largest typewriter case I had ever seen. It was more like an piece of luggage. How does it type? Well, its much like putting a metal plate on the ground and beating it with a ball-peen hammer. It does have a light carriage return and one of those neat key de-jammers. It is a carriage shift machine. I have remarkably few carriage shift machines in the collection and the Skyriter is the only other one. I can see why on that machine, but a CS on something so large is strange. Also, the shift key on the right-hand side is better than the shift on the left-hand side. Left shift works well. Right shift offers some wacky alignment. The carriage doesn't seat well when you use the right shift. I'll have to do a little adjusting for it to be perfect. Are you hungry for some guacamole? 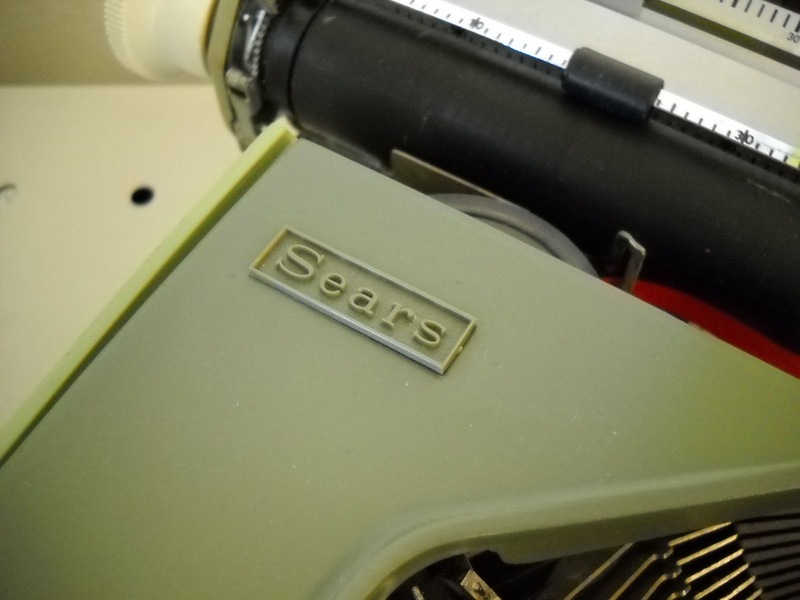 I read, via Will Davis' site that, this Sears Newport is really an Messa (as in our production is a mess-a). The same machine could be had from Royal, Brother or ABC with minor variations in color. 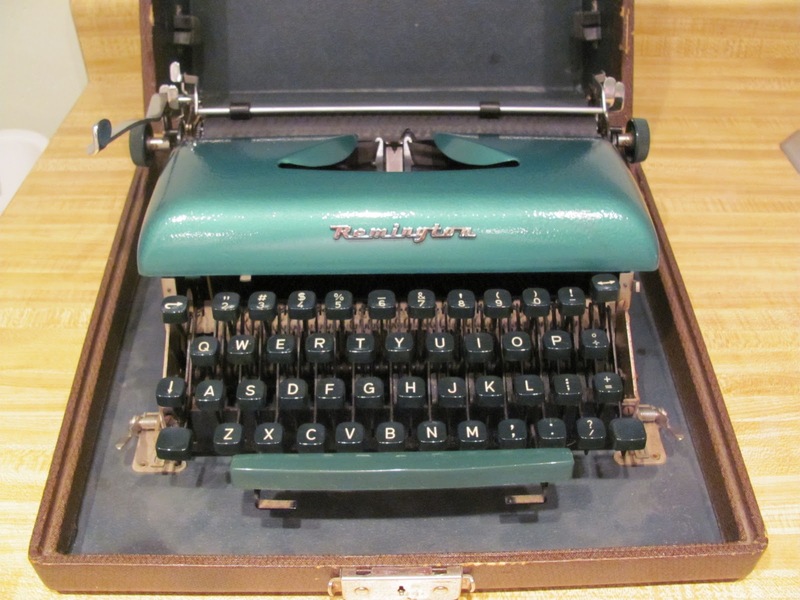 While it may not be as classy as a '38 Corona Sterling, it is an honest typewriter that will now be put to work. If you have more than one typewriter that is in need of a ribbon you could always take 1/2 the ribbon from a spool and put it on a spare. Like magic I can make one typewriter into two. Being a teacher makes you a little creative with money...and apparently typewriter ribbons. Tonight while watching some television, I finished assembling the panels on the newly painted and freshly platen-ed Travel-Riter. It wasn't the biggest project, but it was a lot of fun. All I need to do now is wait for the paint to cure. This should take at least a week. Until then I need to be carful and avoid scratching the finish. The hammerite type paint worked very well and is very shiny. My Sophomore classes are reading Fahrenheit 451 by Ray Bradbury. In the Afterword Bradbury describes how he considers F.451 a dime-novel. It cost him $9.80 in dimes to write at a coin-operated Remington or Underwood. He needed a place to type and the basement of UCLA's library prevented him from wanting to play with his children rather than working on his novel. He indicates that the time constraint really helped him write. 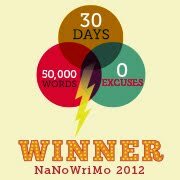 Sounds like the NaNoWriMo challenge many people are working on this month. 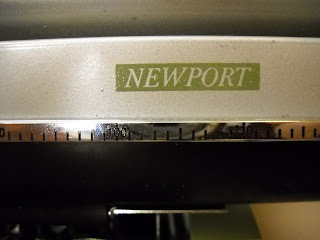 This started me thinking about coin-operated typewriters. At 30, I am not remarkably old, but I do have a memory of coin-op typewriters at ASU. They were in an alcove on the 2nd or 3rd floor of the stacks. There were about 3-4 IBM Selectrics (the early ones, not IIs) ready for students to use. At the time I think it was a quarter for a half-hour of use. I called the Hayden Library to ask whether the typewriters were still there, or if they had been taken out. I was saddened to hear that they were removed (or moved) some time after 2004. I put a call into the facilities manager for the library to see if they had just been moved or were completely removed. Knowing ASU as I do, they are probably in some closet gathering dust. I wonder if there are any still in existence? 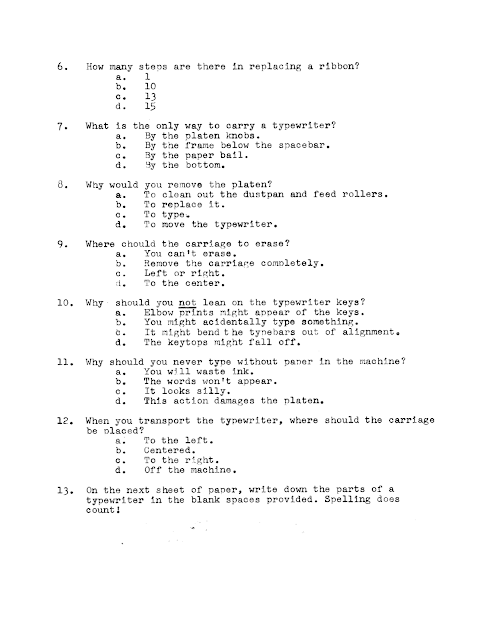 On another note, I came across this very interesting video by Bill Hammack on how the A/D converter (the whiffletree or whippletree) in an IBM Selectric works. Even though Selectrics are not my particular brand of crazy, I have seen so many of the type elements for sale (esp. script). 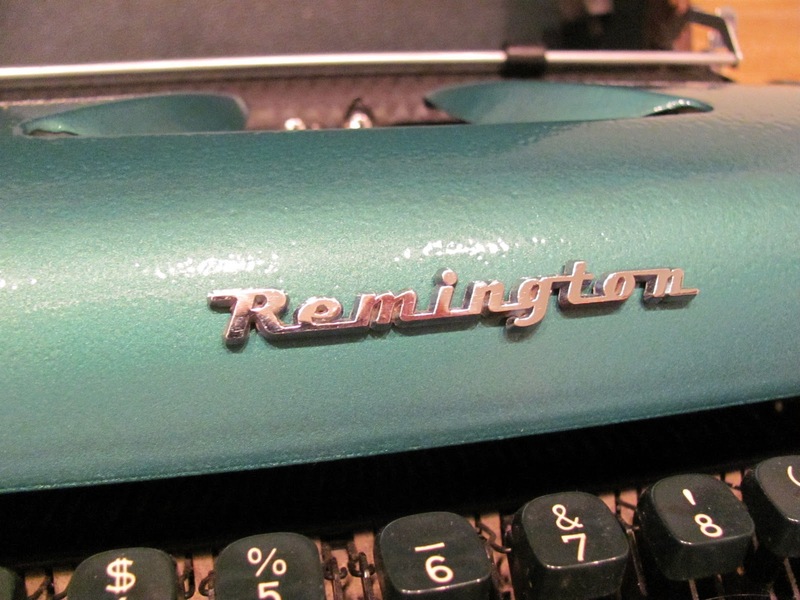 Between all the regular things you do on the weekend, I began to paint the Remington Travel-Riter that I found. The surface of the old machine was rusty and very ugly. The platen was fossilized. I had it in my mind that this would be an easy project. The first challenge to that notion was the platen. The first problem was removing the platen. The platen on this typewriter was clearly never intended to be removed by human hands. Bolts, nuts, weird compression-fit line ratchets all met to foil the work. The biggest hurtle to disassembly was a steel rod that extended the entire length of the platen. To remove it I had to take a pair of pliers and wiggle it loose. That took some time. The dumbest idea was that I could find a suitable replacement for the platen rubber from something around town. I struck on the idea that auto heater tubing might be good. It's made from real rubber and I figured that it would be inexpensive. I went to Checker and asked the clerk if he had something that fit the bill. The tube that they did have fit on the inside diameter, but the outside diameter is a hair larger than the original platen diameter. At the time I thought it wouldn't be a problem. It would later be a problem. Trying to feed the tube over the platen was a challenge. I won't give you the boring details, but an hour of work let to a newly shod platen and a broken line advancement ratchet. It was attached to the end of the platen via a compression fitting. I popped it off and had to re-attach it. It ended up being alright. When I reinstalled the platen, the size was a little larger than before, so things were too tight. I had to adjust the feed roller and the paper release lever so it would work. After fiddling for a while it seems to be working well. Or at least well enough for me. The most exciting part was the painting. I hemmed over what color. I wanted something green, but I was concerned over my painting ability. When I was at Ace I noticed that Rust-Oleum had a Hammerite finish paint in colors. Hammer finish paint really hides irregular substrates and has a very glossy surface. The green color was perfect. I followed the instructions and here is how it turned out. The hammer finish is a look. I like it. I know some people would prefer it to be a mirror finish or something smoother. It says 1950s to me so, it stays. I have quite a few more panels to paint and I will be finishing those over the course of the next few days. When it's all done I'll have a newly painted Travel-Riter. The process of fixing the Silent's linkage was surprisingly easy. Nothing was really bent. One of the junctions where one part of the linkage connects to another worked loose. I looked at the other linkage connections to see how this one was connected. Five minutes later we were in business. I am always surprised with how easy it is to tinker with a typewriter. I know that the professionals would rather you leave it to them. That makes sense if you are not the least bit handy. If you are...go for it! The Adler was pretty easy. The SC Sterling was a piece of cake. This Silent was no problem. If you know how they work or can imagine the pieces fitting together, they are no more scary to fix than anything else. The first mechanical casualty of the CTP has been had. A lovely Smith-Corona Silent has a bent typebar linkage. The young lady who was using it noticed it immediately. I'm not sure if the problem was careless typing or something inherently wrong with the linkage. The O isn't the most commonly used letter. It's coming home with me (sorry honey) and I'll get it working again. I might also give this one a good cleaning. I'm sad about my linkage. On Saturday, the baby went down for a long-needed nap and I was able to visit a couple of vintage and antique stores. 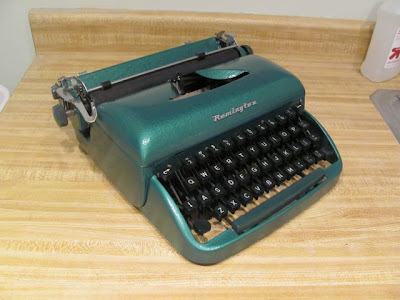 I wanted to find another inexpensive typewriter to make the total in the CTP 10. So, I visited Antique Gatherings on Thomas Rd. and Zinnia's on 7th Ave and Indian School Rd. Antique Gatherings is a very clean antique store, but a bit pricey. Also, they didn't have any typewriters. Zinnia's did, however, have a few that were interesting and not too expensive. The first was a 1930 Royal Quiet. It was in fair shape, but it did not come with the case. The crinkle paint was chipping in a few places. I have a more than reasonable like of Royal typewriters, but I have a nice QDL at home and a brown QDL (of the same vintage) at work. So, I don't need another. 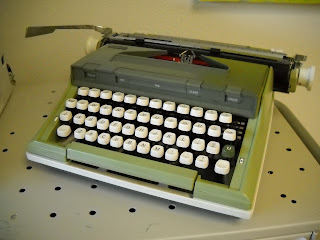 At $30 I thought it was a reasonable price for one that old, but I like complete typewriters. A missing case is not something I would want to deal with. 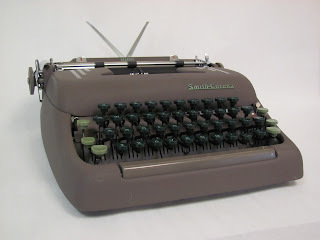 The other typewriter was a 1960s Smith-Corona Sterling 12 in blue. At $19 I thought the price was acceptable and I bought that one. When I got it home and started the process of cleaning it up, there were a few problems that manifested themselves. First, the internal typebar cradle was not in the machine. It was at the bottom of the case. It did not have any cork, rubber, or felt padding, so I took some leftover material from the Skyriter project and make a nice pad. Ace Hardware hand the appropriate replacement screws. The whole process quieted down the machine a great deal. This body-style has a sliding ribbon cover. My ribbon cover was loose because a screw fell out at some point during the life of the machine. This caused the cover to be misaligned and the "1" key and +/= would strike the edge of the opening. Flipping the machine over, I found the shift stops and fiddled with them. I was able to dial in a setting that would allow the typebars to clear the opening of the ribbon cover. They clash sometimes when the cover is not properly seated, but we can live with that. There is one problem; I have an extra screw and spring that came from the machine, but do not appear to go anywhere. The machine works fine. I think that the spring might be for the lid mechanism, but it dosen't really matter. It's a perfectly fine typewriter that now puts us up to 10 total typewriters. 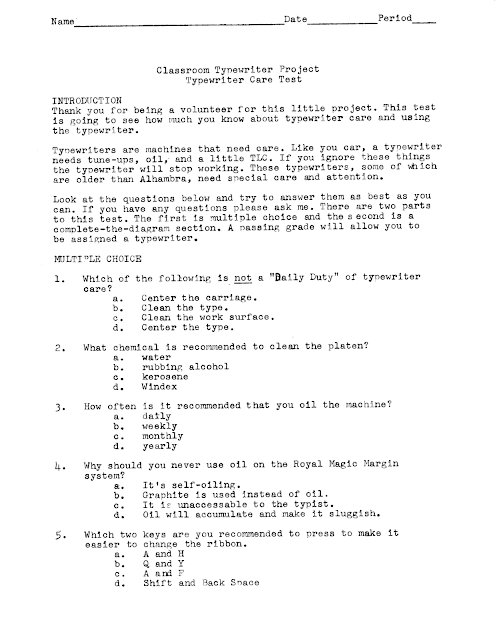 I grabbed two sheets of paper, pulled my chair up to the Royal HH, fed them in, and crafted the typewriter care exam. 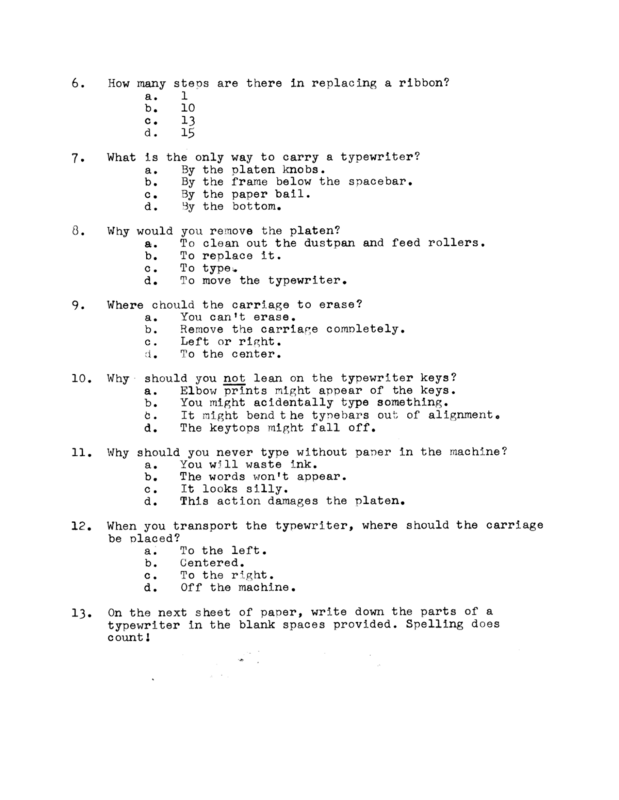 The questions for this exam come from "Typewriter Care: What to Do, How to Do It" pamphlet created by the friendly sounding Federal Work Improvement Program. (The file is hosted on a great site called Machines of Loving Grace. Please, give it a look.) If you haven't read it, do so. It's informative and fun! The entire work is geared towards office typewriters, but there is some really great information that can be applied to portables. While this is not a very serious assessment, I wanted to have some basic knowledge test to make sure that the typewriters are taken care of. D., a young lady in my 5th hour, was the first one to take the test and she scored an 84%. With a score like this she can choose a typewriter that will be hers during the duration of the class period. 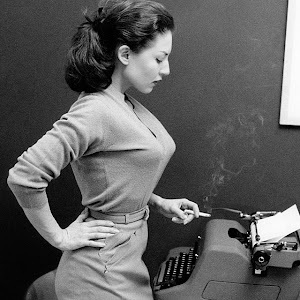 She decided Smith-Corona Silent. She's going to be the only one using this typewriter during 5th period. If she wants to use the machine for typing journals, she can. If she wants to use it for answering worksheets or questions, she can. 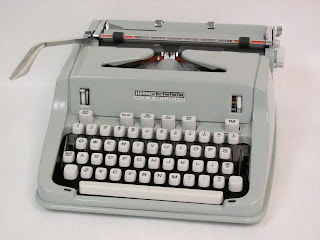 The next step in this project is just this; how does a student perform when he or she develops a personal connection with a typewriter. UPDATE: 11/10/10 There is a small type-o in the fisrt page of the test. I am aware of it and I have started the corrections. We are slowly running out of space for typewriters. It's fun to see so many, but they are seriously everywhere. This Royal Quiet Deluxe (a gift from Richard Polt) has taken a spot on the built-in bookshelf where the books of quality reside. 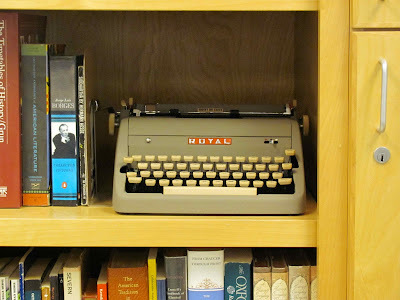 I think it is fitting that this typewriter is next to a copy of Borges Ficciones. In this work there is a story called "The Library of Babel" that has a connection to typewriters. The premise of the story is that the universe is a never-ending series of hexagonal rooms. In this room there are the necessities of human survival and four bookshelves. These bookshelves contain books in which are printed a seemingly random selections of letters, spaces, and punctuation. If the rooms are truly infinite an accurate and complete copy of every book in the world in every language exists somewhere in the library. There are so many books that the librarians move around the rooms depressed and looking for the answer. Their behavior leads to the creation of religions. Some of the librarians, called purifiers, destroy books they deem heretical. As they do this they search for a mythical crimson room. The infinite-- and ultimately worthless-- arrangement of the letters in the books forces the people to try to find answers in an unanswerable universe. The inspiration for this story comes from Borel's infinite monkey theorem. The theory is that if a monkey presses the keys on a typewriter for an infinite amount of time it will almost surely type the complete works of William Shakespeare (also on this shelf). 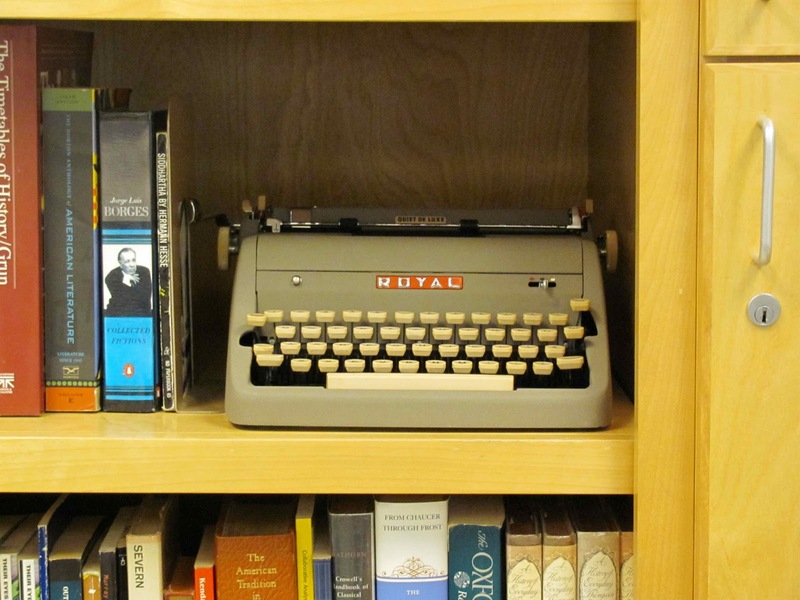 It's fitting that a typewriter is sitting on a shelf next to a book inspired by a theorem that involves typewriters. A tenuous connection, yes, but a connection that makes me smile. 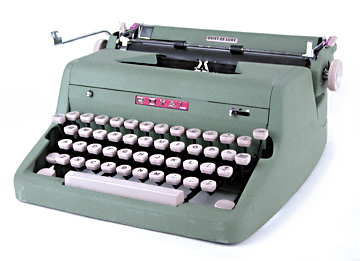 As for the typewriter this is your average Royal Quiet Deluxe from the late 50s. Of the 50s QDLs this line is my favorite for two reasons. First, they come in color crinkle paint. I might be one of the few people who loves crinkle paint. It is very had to damage it. I have never seen a document detailing all the colors available, but our classroom typewriter one is tan with caramel keys (all my names). The green model with white keys (as seen to the left) is particularly charming. The second reason why this is my favorite 50s QDL would be the red badge. I like the brightness of the red and the shine of the letters. This one is in very good condition. As Richard mentioned, this typewriter was owned by a very cautious owner. There is barely a scratch to be found on it. It is as close to new as you can find. 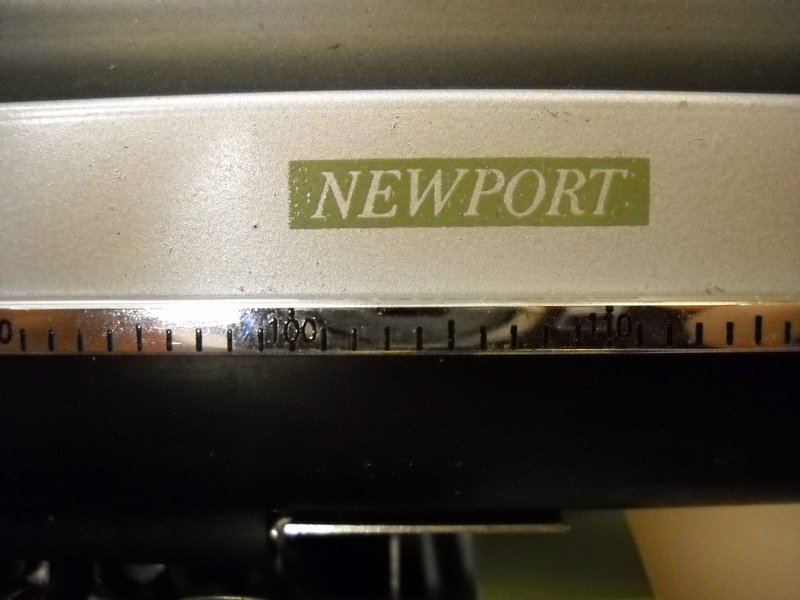 It ranks among our special typewriters. Something else that I like is this poem by Koertge that alludes to the Borel theorem. 1. I have a Remette that is need of some TLC. When I got it the j key was oddly clashing with another linkage. I thought I could fix it by bending a bit of the linkage back into position. I broke it. 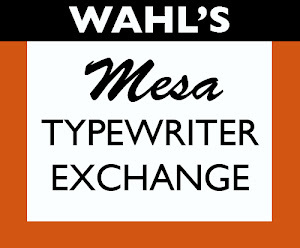 Every other key works just fine except the J. I called Bill Whal at the Mesa Typewriter Exchange and asked him about fixing it. I learned that you can silver solder the broken bits back together. That is going to be one of my projects this weekend. 2. I found a pretty cool Remington Travel-Riter at a yard sale for $1. It's in fair shape, but I want to paint it a cucumber or celery green. Will any of these be done? I probably can fix the Remette. 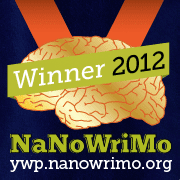 I can get started on the Travel-Riter, but I probably won't finish. This, of course, is in addition to my other big weekend project; taking down Halloween decorations. When it comes to the new set of inventories, the news is that there is no news. 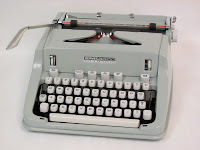 Still, 100% of all students using a typewriter on a daily journaling activity enjoy using the typewriter. We're back into the 80s with students strongly agreeing. Around 83% strongly agree. The remaining students just agree. 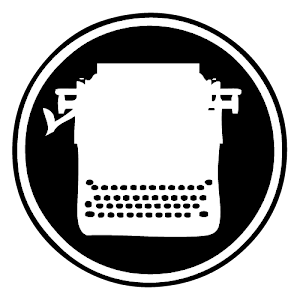 When it comes to meaning, a majority of students (72%) feel the typewriters do offer a conveyance by which their writing has more meaning. With these numbers similar to the last set of inventories analyzed on 10/14 I feel that there is a significant amount of support for my original supposition that typewriters do have a place in a 21st century classroom. They are not the dinosaurs that many would suppose them to be. I am really heartened by this. Education, for many years, has been victim to the quick gimmick and fast fix. I see this victimisation in all the programs, plans, and ways of fixing things that teachers have had to implement. Many people mean well with their strategies, but it's nice to know that the lowly typewriter can do much to enhance the experience of the young writer. Will we see a come-back for the typewriter? No. It's days were numbered many years ago, but as there are many classic cars still on the road I hope there will still be typewriters in schools. What is this leading to? Well, I know that there is a special connection between the adolescent writer and the instrument of composition. 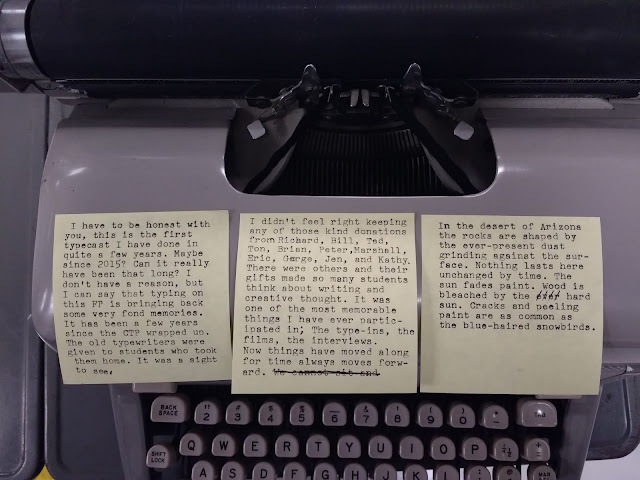 I want to quantify that relationship into a series of understanding statements that really get to the heart of the typewriter-student connection. This will take us into Phase 2 of the project. As I mentioned in the post on the xxth, a core of around 9 students are going to be assigned a typewriter to use for the entire class period. They will make the decision about what will be completed on the typewriter. In addition to the inventory they will be asked to complete a few reflections that, with their permission, I hope to post here as typecasts. I am looking forward to this new phase for the project. I have been happy with the new set of inventory results which will be published later this week. However, I am now interested in seeing how students create a personal relationship with a typewriter. So, I am going to make a small change in the way that the project is conducted. Before the planned change students were allowed to select a typewriter that they wanted to use. It was an entirely first-come-first serve approach. Frequently the students would switch typewriters looking for the one that they wanted to use the most. By this process they could not create a personal relationship with the machine to learn all of its quirks and habits. Part II of the project will allow them to create this intensely personal relationship with the machine. 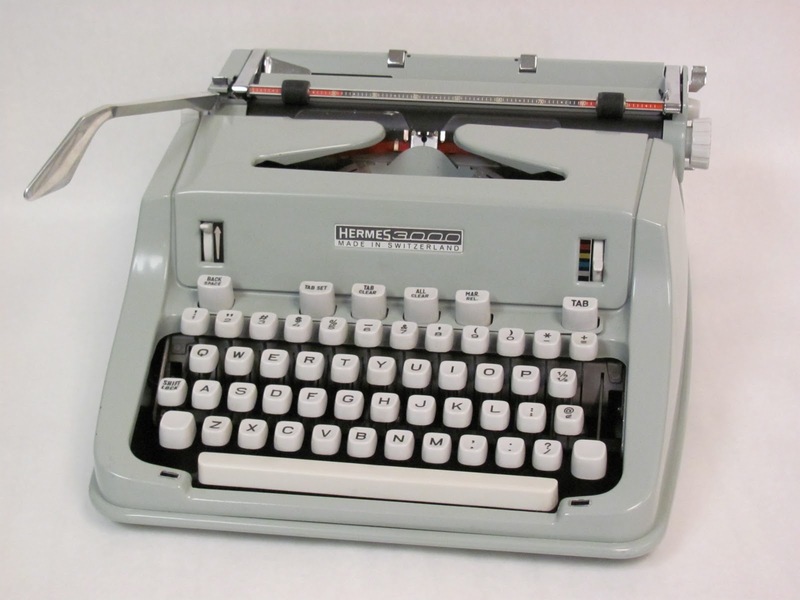 I have asked for volunteers who would be willing to fill 9 slots corresponding to the 9 typewriters available to use. After they have proven a proficiency in using and caring for the typewriter, they will be assigned one machine. This machine, for all intents and purposes, will become their machine. They will be 100% responsible for its upkeep and care. If a ribbon is dry they will need to replace it. If the margins are set incorrectly, they will need to set them. If there is a problem it will be their responsibility to tell me about it. The scope of what they will be using the machine for will also change. No longer will it be for journals exclusively. They can use the machine for all their general work. Whatever needs to be typed can be done on the typewriter. I will not be prescribing the parameters of their acceptable use. The student will have to make the decision whether to use the machine or pass for that day. To prove proficiency in using the typewriter, the students will need to pass a series of examinations. They aren’t hard, but they do show a dedication to the project that might not manifest in the more casual users. The first test is based on the pamphlet “Typewriter Care” by the Federal Work Improvement Program. 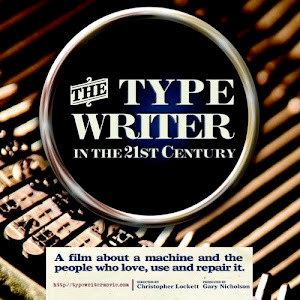 The second test is based on an illustration on Richard Polt’s web site detailing parts of the typewriter. If they pass both parts, then they can start using the typewriter for whatever work they choose. I have to work out some fairness issues in the procedure, but I think that it will allow the typewriters to be used to a greater effect.